I had scheduled a dental appointment at Tara’s dentist, and the only time they could get me in was 11:00, which happened to be the same time Tara had to start work (she’s a nurse), so I couldn’t babysit the kids today. But the kids were up early and we had some playtime before packing them up for the babysitters, who happen to be part of an Amish family nearby. The kids only have to go 2-3 afternoons a week, and it’s a wonderful arrangement. Two Amish girls look after 4 kids (there used to be 3 babysitters, but the oldest one just got married) on the family farm, and they occasionally go outside to “help” with chores and all. It was fun to see the place when we dropped the kids off. I continued on to my dentist appointment, and now I’m done with that until I get back to my regular dentist. I hadn’t heard back from the vet yet about a possible appointment for Tula, but I was nearby, and stopped in in person. They agreed to see her at 4:30. 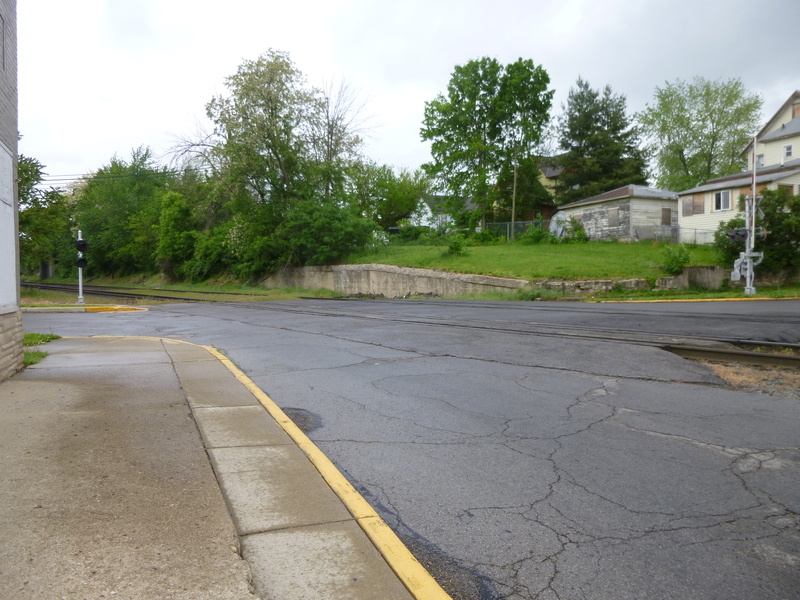 So Tula and I just stayed in Bellefontaine, and we walked a couple miles around the downtown area. 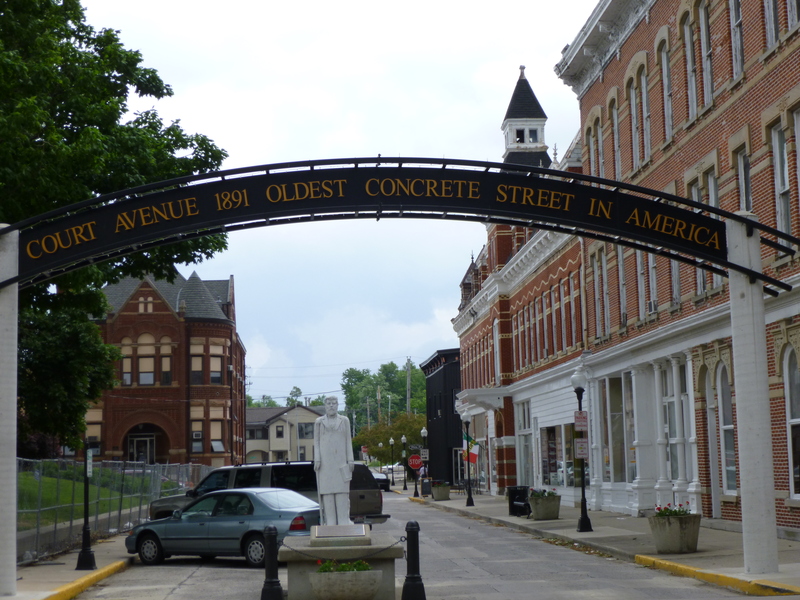 Bellefontaine’s “claim to fame” is having the oldest concrete street in the US – it was paved with concrete back in 1891. Tula was ready for a rest, so I put her in the car, then went on a long walk on long streets through residential areas. 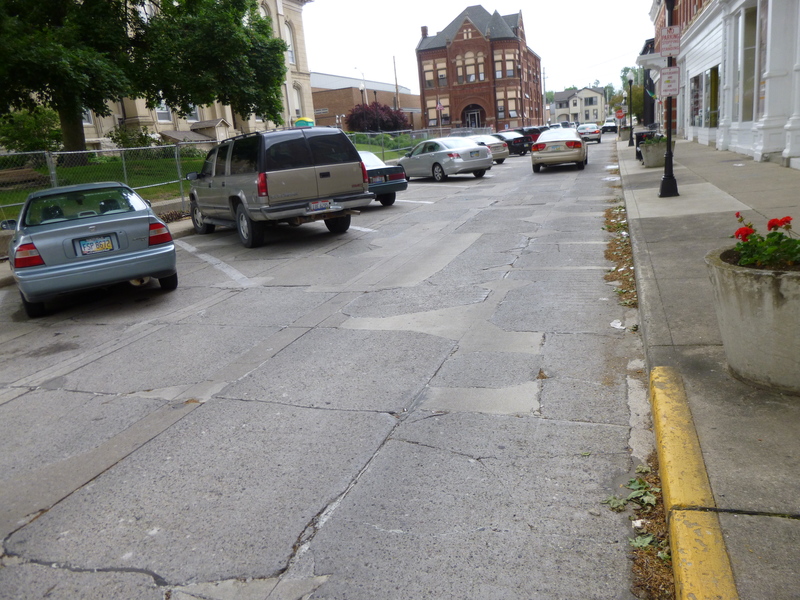 Bellefontaine was a good town for walking, and I finished up the 7 miles that I did today in yet another part of town. 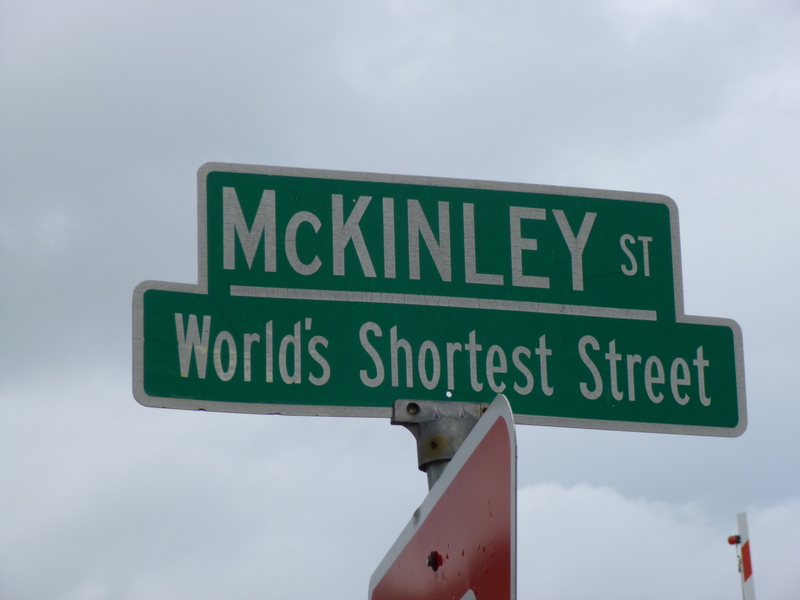 This time I ran across “the world’s shortest street.” It was only a few yards long – connecting one street to another. Then it was time for Tula’s appointment. They were really busy – possibly people wanting to get in before the Memorial Day weekend. We had to wait nearly an hour extra for our appointment, but it was worth it. We went over Tula’s history, and my concern about Lyme disease, and the vet spent a lot of time with us. Tula was terrified of the exam table – it was low down like a scale, but then it could be raised electronically so that large dogs could be examined at a height that works well for the vet. Tula didn’t like being raised up like that. The vet did a thorough physical exam, including stretching her neck, feeling her backbone, and stretching out all her legs, where she found sore spots in one of her “wrists” and both back knees. There were no swollen joints, which is a good thing, but definitely some tenderness. We had decided to do a full blood screening, and the blood for the Lyme disease would have to be sent out, so she needed to get enough blood for both the in-house tests, and to send out. So she had to use the vein in Tula’s neck, but had to try a few times because the vein kept rolling. Tula’s vital signs were all normal, and she could finally get off the table, and I took her back out to the van while I waited for the test results. After about 1/2 hour, the vet came out to talk with me again – all the blood chemistry tests they had done were normal, but it would take 4-5 days to get the Lyme disease results back. We talked about how we would handle things with me on the road – if the Lyme disease test is positive, she can prescribe the antibiotics, and we’ll figure out how to do that once we know where I am; if the Lyme disease test is negative, she suggested maybe putting Tula on a course of pain pills for the tender joints while we sort out what other tests we might need to do. I didn’t make a donation today since I had doubled up yesterday. The vet appointment took a lot longer than expected, so I got back to Tara’s house past dinnertime, and we just ordered in some Chinese food and enjoyed the evening.